A Rod Smith personal appearance, Rod Smith speaking engagement, or Rod Smith endorsement will reflect well on your company. To hire Rod Smith now for any corporate appearance, fundraiser, motivational speaker event, personal appearance, autograph signing, or website endorsement please contact our celebrity agents at 1-877-6-SPORTS. We will contact Rod Smith or contact Rod Smith's agent and provide you with the booking fees and availability immediately upon your request. Direct Sportslink is the only sports speakers bureau and talent booking agency based in the United States securing only sports talent for corporations, associations, and organizations for motivational speaking engagements, personal appearances, and endorsements. We are the premier sports celebrity booking agency and a sports celebrity procurement expert. Accordingly, we will provide you with any relevant Rod Smith website information and booking agent details so that you can hire Rod Smith for your next event. 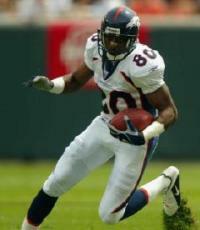 Rod Smith is a former NFL wide receiver who played his entire career with the Denver Broncos. He played college football at Missouri Southern State. Smith is the first undrafted free agent to have ever surpassed the 10,000-receiving-yard plateau. Smith enjoyed a stellar career at Missouri Southern State University, finishing with conference records in career receiving yards (3,043) and touchdowns (34). He also broke the school's reception record (153), and was named first-team All-America by AP, Kodak, Football Gazette and NCAA Div. II sports information directors after his senior year. In his final season, Smith caught 63 passes for 986 yards and 13 touchdowns, and was a finalist for the Harlon Hill Award, given annually to the top football player at the Division II level. He was named Missouri Southern's Outstanding Graduate in 1994 after completing his collegiate studies with three degrees, in economics and finance, general business, as well as marketing and management. In twelve seasons as an NFL player, Smith has had eight seasons of at least 1,000 receiving yards. He's had two seasons of at least 100 receptions (2000: 100; 2001: 113). His reception total in 2001 led the league. He was a starting wide receiver of the Broncos' back-to-back Super Bowl championships in 1997 and 1998. In the Broncos' 34-19 win in Super Bowl XXXIII, Smith had 5 receptions for 152 yards, including an 80-yard touchdown reception. 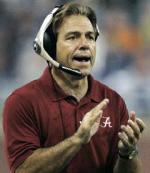 He was a finalist for the Walter Payton Man of the Year Award in 2004. 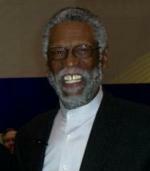 In 2008 and 2009, Smith was inducted into the Division II Hall of Fame and the College Football Hall of Fame, respectively. Based on your interest in Rod Smith as a speaker or for a personal appearance, Direct Sportslink has provided you additional links below for other sports talent with similar appearance fees, speaker topics, and categories that match Rod Smith.